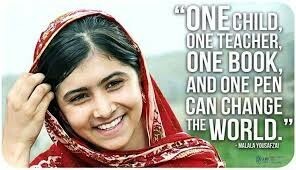 Education advocate and Nobel prize winner Malala Yousafzai! Yesterday, Malala received the Nobel Peace Prize, along with Kailash Satyarth, who works aginst chld slavery. In her acceptance speech Malala said: "It is for those forgotten children who want education. It is for those frightened children who want peace. 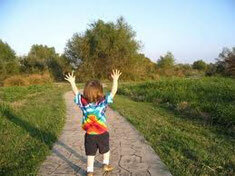 It is for those voiceless children who want change. I am here to stand up for their rights, raise their voice. It is not time to pity them. It is time to take action so it becomes the last time that we see a child deprived of education." Malala's family runs a chain of schools in Pakistan. "On the afternoon of 9 October 2012, Yousafzai boarded her school bus in the northwest Pakistani district of Swat. A gunman asked for her by name, then pointed a pistol at her and fired three shots. One bullet hit the left side of Yousafzai's forehead, travelled under her skin through the length of her face, and then went into her shoulder." This incident sparked an outcry that has not diminished since it happened. Malala is a voice for worldwide access to education. Once she recovered from her wounds, Malala has spoken worldwide to encourage changes, including at the United Nations. Yesterday's Nobel Peace Prize is an acknowledgement of her worthwhile work and will give weight to her words for years to come! This astonishing young person can give us hope in a sometimes dark world.